Happy Monday, friends! Today I am coming at you with a fitness review that I have been really excited about! If you follow me on social media then you know how much I have been LOVING True40 Fitness Studio! True40 is a low impact workout, but it gets your heart pumping during warmup and your body shaking during all of the strength training and muscle toning! I especially love how all of the instructors constantly remind you throughout class that this is “your workout”. I tend to like to push myself in my workout so I usually take all of the “challenges” they offer and see if I can drive myself until my absolute breaking point. 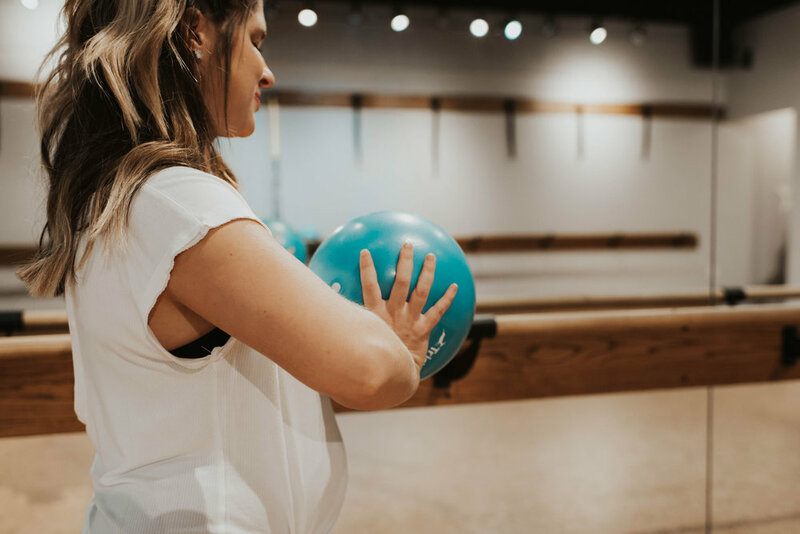 BUT, with being pregnant, I LOVE that there are plenty of modifications and opportunities to take it a little easier if I’m getting to out of breath! I can’t talk about how much I love True40 without mentioning their childcare! Anniston LOVES it. And if you know Anniston, that is a big deal! Ha! She doesn’t love when mommy leaves her somewhere, so to see her walk into the True40 childcare with a smile on her face makes me so happy! She looks forward to it and I’m sure all of the attention she gets while there doesn’t hurt either. :) I love that their childcare is small (usually a maximum of 5 children) so that you know your child is getting enough attention and they won’t get overwhelmed. Everyone is always SO kind to Anniston the minute she walks in the studio so she knows she is cared for and welcome there! I love that they provide the childcare option as a way to still promote healthy living for us moms with little ones at home! When you walk into a True40 studio you will see girls in high school and college, young moms, middle aged women, and a few women in their 60s and 70s (basically my inspiration!). I love that the class can be for everyone through the challenges and modifications offered and that the instructors are always there to help when needed. Every class the instructors begin by asking if there is anything new going on with our bodies so they can offer guidance and wisdom in adjustments throughout class. At True40 you begin with a low impact, but fast paced warm up to get your heart rate up (my favorite). You then move into leg work (something I have a love/hate relationship with! ha! ), combo work (arms plus a little bit of everything else), glute work, and then abs! As you finish up your ab work you then go into your cool down/stretching/yoga flow (my personal favorite while being pregnant haha). I love how the instructors turn the lights off during the end of class to give you time to refocus your breath and relax your body before going about your day. By the end of the 60 minutes you definitely feel like you got a total body workout all while be surrounded by an encouraging community! You can’t beat it! I attend classes at the True40 Auburn Studio (obviously haha), but they also have studios in Birmingham, Tuscaloosa, and as of today, ATLANTA! So all of my Atlanta friends, get your booty over there and then tone that booty up! If you ever want to try a class for FREE then take one on me with code: COURTNEYF. All photos by the lovely and talented Nathaly Marques.